Our Undergraduate Programs occur only during the summer months. 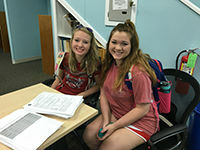 Students interested in attending summer classes should visit our Summer Programs page for complete information on how to apply and what classes will be offered. Our Graduate Programs occur year round. With many Ph.D.'s in multiple disciplines we have a variety of subjects for potential candidates to choose from. For more information please visit our Graduate Programs page for current Ph.D. list and information on how to apply. Campus wide, University Programs instructional and research facilities include: 5 lecture/lab classrooms, 3 seminar rooms with web conferencing capabilities, a library and computer center; a culture lab, a wet lab; a flow-through mesocosm; a marine mammal necropsy center, and oyster hatcheries (operated by Auburn University). 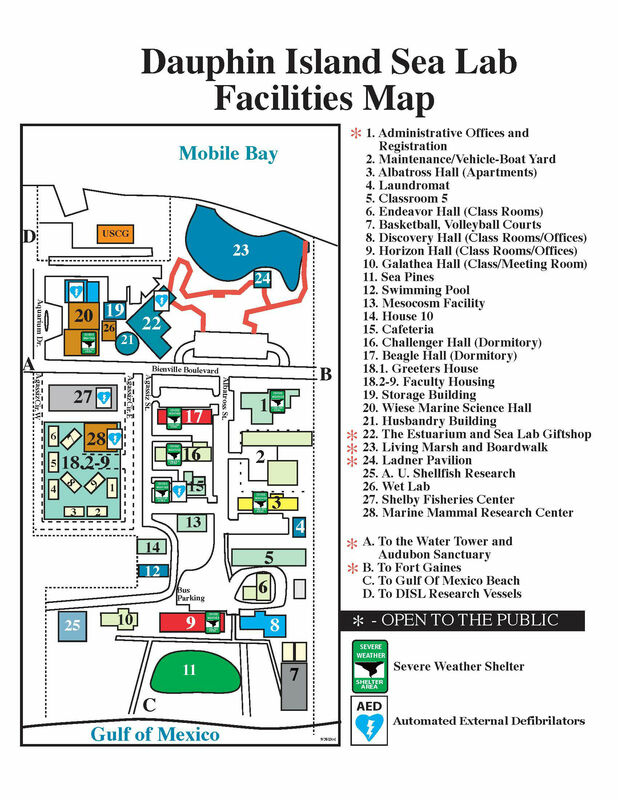 Most Dauphin Island Sea Lab research is housed in the Marine Science Hall (MSH), which contains 24,000 square feet of common and faculty research labs, as well as faculty, post-doc, graduate, and administrative offices. Marine Science Hall recently expanded the marine chemical instrumentation space. Pictured is the Skalar San ++ auto analyzer for dissolved nutrient analysis. The MSH marine chemical instrumentation facility operates as a technical support lab with equipment measuring dissolved nutrients, total carbon and nitrogen in plant, animal or sediment materials, C12 and C13, dissolved inorganic and organic carbons, total nitrogen in liquids, chlorophyll fluorescence, metals and some non- metals traces. MSH technical support services are available to assist in dive support, as well as designing and adapting field equipment needed in support of research projects. 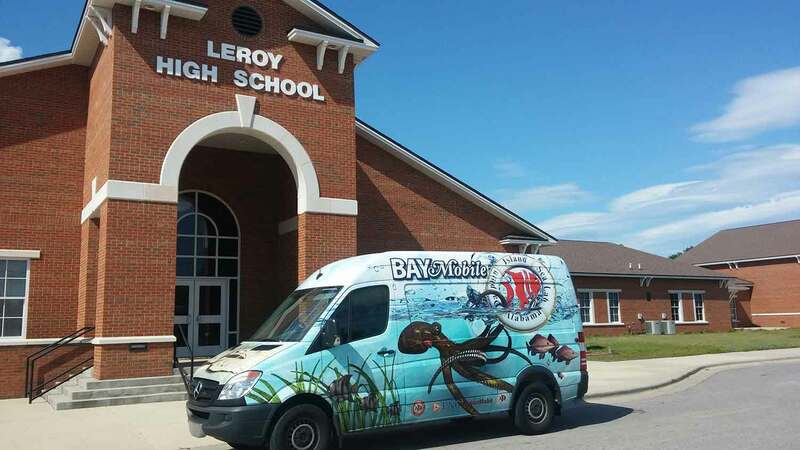 The Shelby Center for Ecosystem-based fisheries management, a LEED certified 10,000 square foot facility, is home to marine fisheries labs, a 200 person seminar auditorium, an atrium, web enabled conference room, and administrative offices. Flow-through mesocosm allows DISL scientists to balance control and realism. 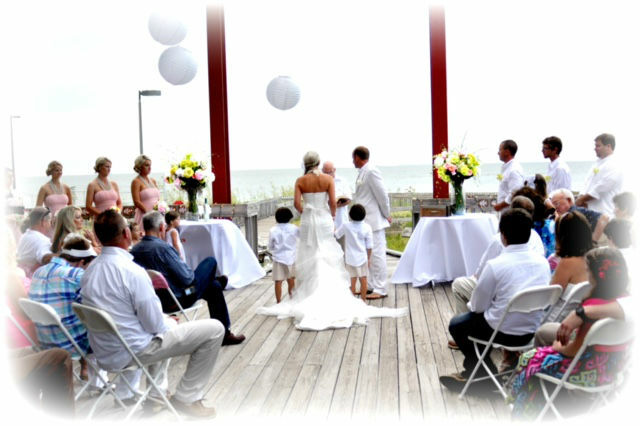 The Dauphin Island Sea Lab's location also allows for a state of the art flow-through mesocosm. 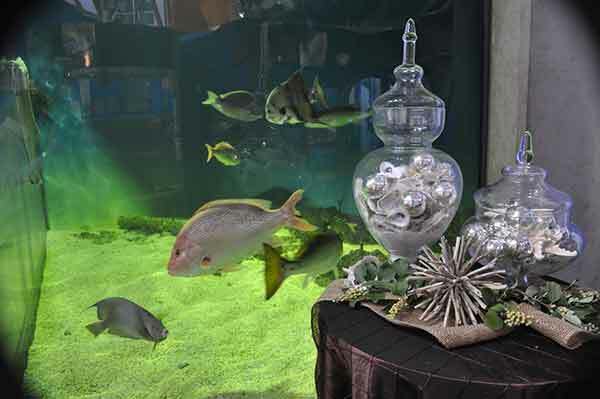 The mesocosm includes sixteen 1,000 gallon tanks and four 5,000 gallon tanks. Pipes connect the mescosm to the Gulf of Mexico to allow DISL scientists to replicate the natural environment for a variety of experiments. 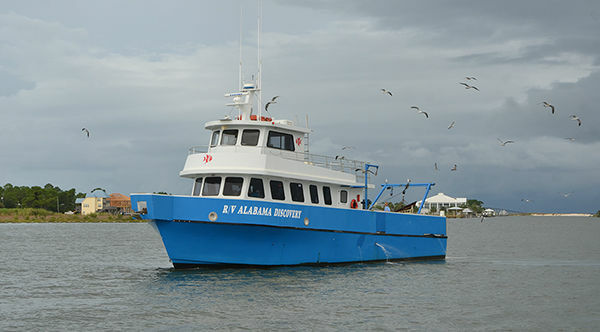 The Dauphin Island Sea Lab maintains two research vessels, the R/V E.O. 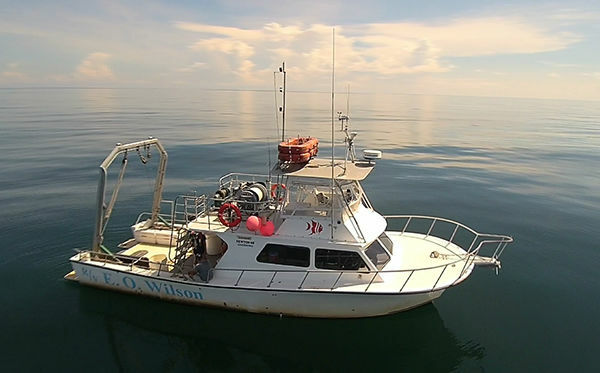 Wilson and the R/V Alabama Discovery. The R/V E.O. Wilson is a 46 foot Fiberglass vessel made my Newton industries. It is powered by twin John Deere marine engines with a cruising speed of 16 knots. It has the capacity to carry up to 20 people. As a research vessel it comes equipped with 500 llb rated davit, a winch with the capabilities of pulling a 20 foot net, and the capacity to do long-line and vertical line research and instrument deployment. The vessel is equipped with state of the art VHF, Fathometers and GPS instrumentation. The R/V Alabama Discovery is a 65 foot x 23 foot wooden vessel covered in fiberglass built by Chesapeake Boat Works in Maryland. The vessel has twin 650hp Cummins engines and can cruise at 15 knots. It can carry a class of 38 students for its educational mission. For research cruises the vessel has a 500lb side davit, a large winch with the capabilities of pulling a 45 foot net and full instrumentation package. 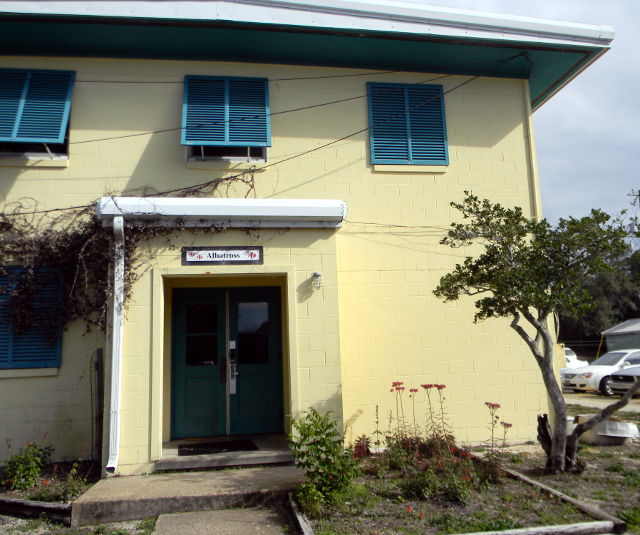 In addition to the Wilson and the Alabama Discovery, the Dauphin Island Sea Lab maintains several small (14 to 30 feet) outboard boats and skiffs. The Challenger houses 86 individuals and is used only by undergraduates. 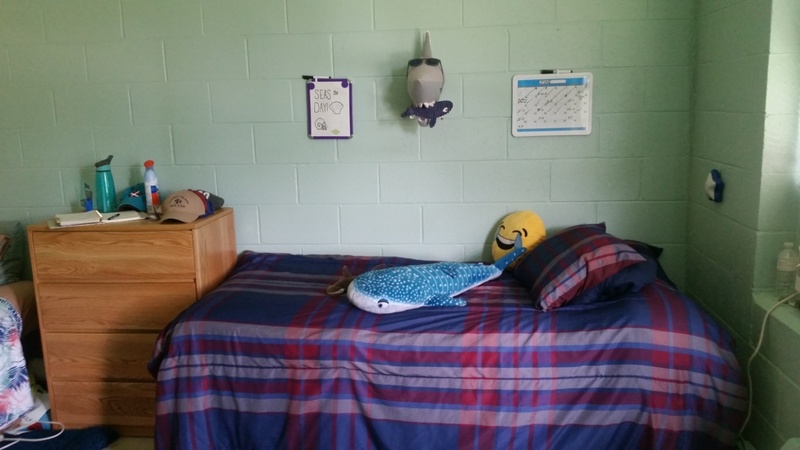 Each dormitory room has a two person occupancy and is equipped with an individual air conditioner, twin beds, at least two closets, and a study table. Albatross offers a two-story efficiency apartment complex with twelve units for graduate students and visiting faculty. 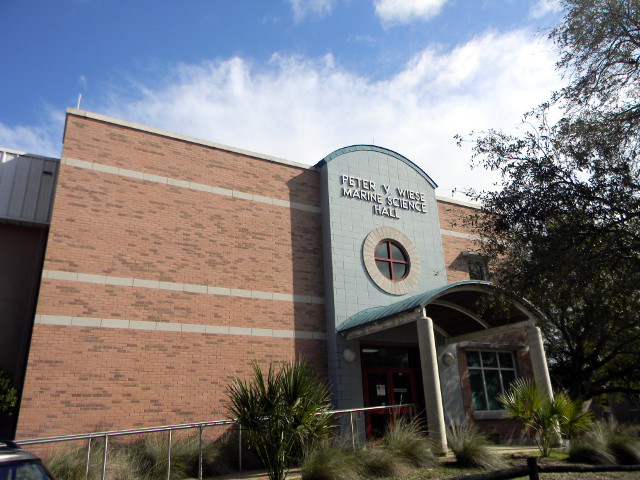 Coin operated washing machines and dryers are available on campus. 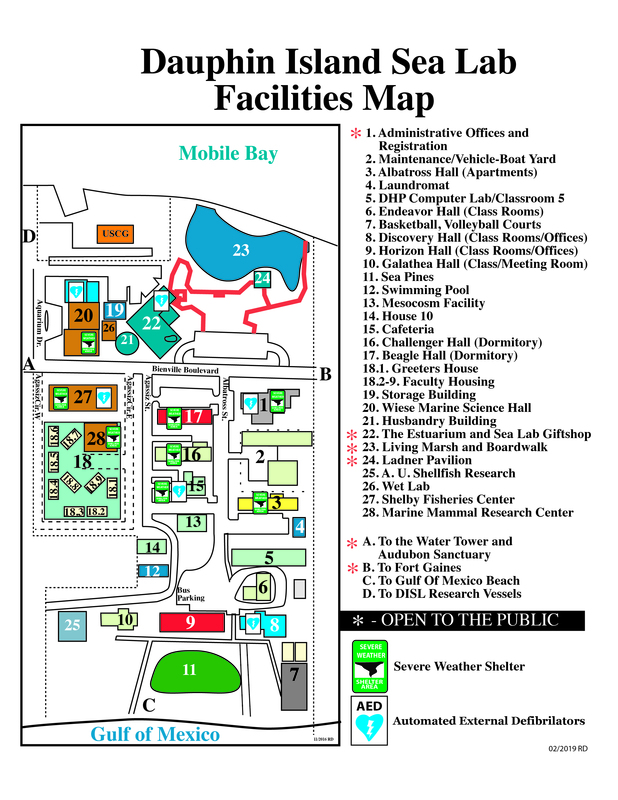 Facilities at the Dauphin Island Sea Lab have been renovated and constructed to provide access to all users. To assist DISL in accommodating any special needs that a student may have, please notify your specific Registrar before your arrival of any disabilities or conditions that require special accommodations. Regina Kollegger is the Registrar for University Programs. The newly rennovated May's Cafe sports a fresh salad bar, home cooked breakfast, lunch and dinners, and a cheerful staff.